It was a hot humid Greek summer in 2012. My second child had just been born. 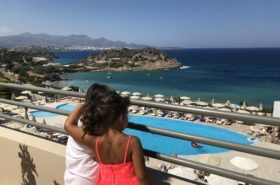 We were looking for a family-friendly hotel to escape the Athenian heat. 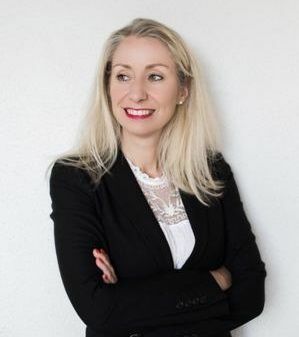 I wanted a comfortable place that would allow me to leave the newborn inside but near a beach or pool where I could spent time with my other child. I wanted something nearby Athens with good food and time to relax. Whilst searching the internet, I remembered the five-star hotel that me and my husband had found some summers before in Evia. We had not stayed there at the time, but ran into the place in search for a good meal. We had a lovely family dinner there under the stars that summer evening. 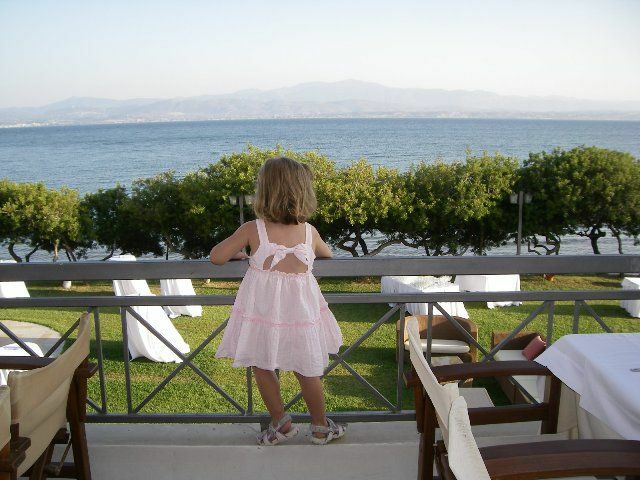 The restaurant on the veranda was overlooking the sea and our child was happy in her highchair. The name of this hotel? Negroponte Resort Eretria. 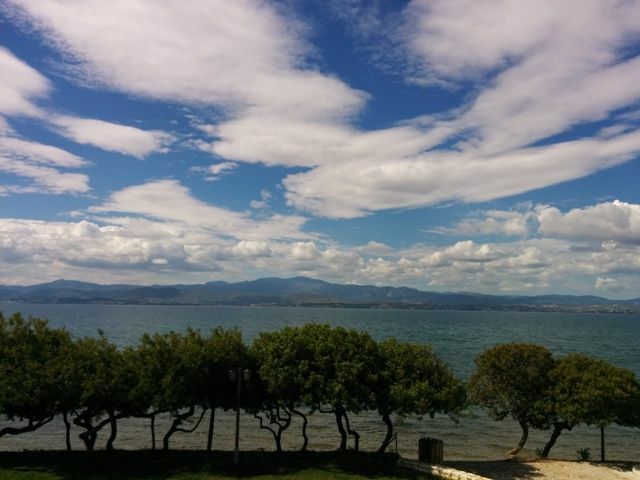 Why we keep going back to Negroponte Resort Eretria? So we made a booking at Negroponte Resort in the summer of 2012. This time with a newborn baby and a toddler. And we loved it. We had booked for five nights and we ended up staying two weeks. And after these two weeks in 2012, more summer/winter vacations and weekends followed. We have spent Easter and Carnival there too (great food and entertainment for the kids!). The last couple of years it became a tradition to celebrate our daughters birthday here. Our recent visit was in the summer of 2017. I was happy to find out that quality hasn’t changed. In fact, things are constantly improving. We have made many memories at Negroponte Resort and it is a very special place for me and my family. Let me tell you my experience. 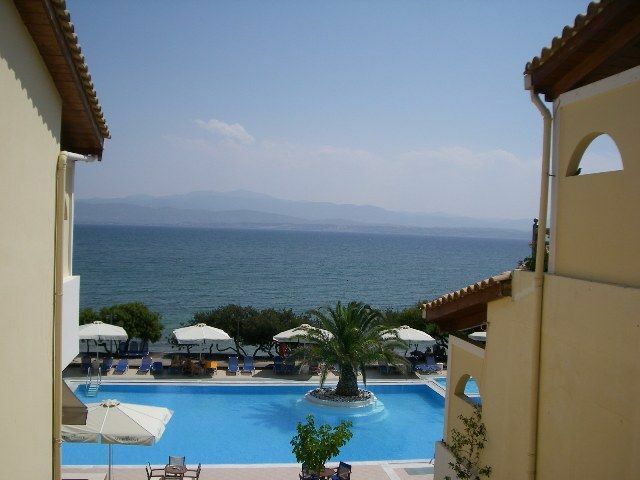 Negroponte Resort Eretria is located on the island of Evia. Although Evia is an island (the largest in Greece), it is connected to the mainland at the town of Chalkida (near Eretria) by a bridge. Therefore it is possible to reach the island and the hotel by car. 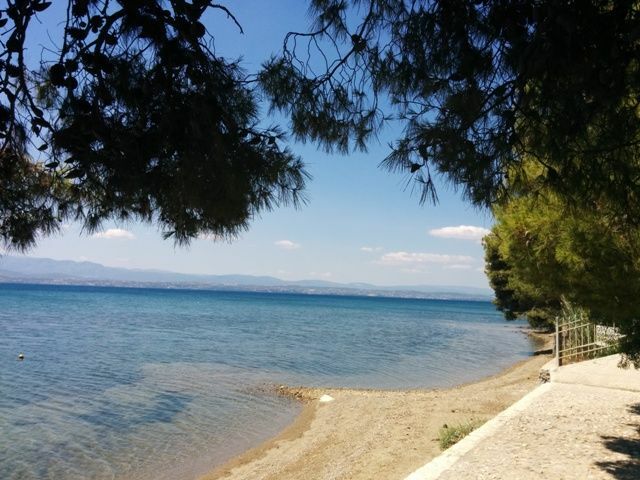 You need an hour from the city of Athens via road and about 1, 5 hours from Athens airport. If you like the island experience, you can opt for taking the ferry boat (20 minutes sailing to Eretria) from Skala Oropou. I don’t like to travel far with kids and when they are babies, I found car travel the most comfortable. Depending of your starting point, there are some tolls involved if you travel by car. The ferry boat uses a ”roll on roll off system” for the cars and is easy to access and inexpensive. We recently paid 2 Euro for a passenger ticket and 10 for the car. For more information on Evia check here. I have also travelled to Eretria by public bus. Again, an inexpensive and short trip from Athens. This summer, Evia finally got connected with the Athens Airport by a intercity bus line. The hotel has a transfer service as well. The resort is very small, everything is nearby. Leave your car at the valet parking and start relaxing. No need to use your car at the resort unless you want to go around Evia. Negroponte Resort has 5 buildings that are connected via inside corridors, passages and gardens. All are built around an outdoor swimming pool and the sea in front of it. There are different kind of rooms options. There are standard double rooms but also large penthouse suites with a fireplace and private jaccuzzi. You can opt for sea view, garden view or the mountains and forrest. I have tried the penthouse suites, the connecting and two suites rooms and the suites with sea view. With the baby being very small, we liked the large suites in the mainbuilding. We easily took our stroller inside and we liked to be close to the breakfast area, the kids club and the restaurant. We also liked the interconnecting rooms and two-room suites. These were very good when travelling with a nanny or friends. Onces the children both walked we opted for the garden rooms with large safe balconies. All rooms are near the pool and beach. There is hardly any walking involved and I found this extremely convenient when the baby was young. Breastfeeding was very easy in this hotel. Now that my children are older I prefer to stay in the garden rooms. I feel very safe at this resort and the staff knows my children very well. They can go around the hotel themselves. I have not been dissapointed by any of the rooms. They are spacious, luxurious and very clean. All rooms have marble bathrooms, some have wooden floors and/ or a fire place, you can check more room details on the website. In July 2017, I stayed with my girls in a garden room with one double bed and one single bed. It was the smallest room I had stayed in so far and yet it was more than comfortable. Whether you are in the main building or in the garden area, all rooms are only a few steps away from the beach and swimming pool. There is an indoor pool with jaccuzzi in the atrium. Outside is a large fresh salt water pool including jaccuzzi with seperate small children pool next to it. I found the pool always extremely clean. I love the fact that the kiddie pool is next to it as I could watch both kids at the same time. And I can even have an eye on the beach and sea from every lounger around the pool. The hotel offers pool/beach towels and pool noodles so no carrying around of wet beach gear. People often ask me about the beach in Eretria. The sandy beach at Negroponte Resort is small and not the kind of long golden Greek stretched beach with turkoize waters that you may be used in Greece. But the sea in Eretria is calm and very clean. I have always found enough space to sit or play on the little beach. The water is shallow and there are some rocks. You can bring watershoes if your children are not used to that (or you can buy a pair in the little hotel shop) The sea here has lots of sea plants and has a fascinating underwater fauna that is good for snorkeling. My kids love looking for shells and little crabs here. 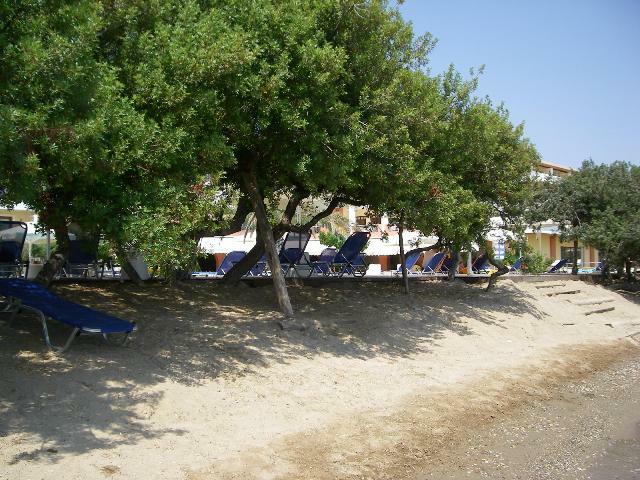 Small olive trees on the beach offer lots of natural shade on the beach. Around the pool there can be some noise of children playing. But further down the pine tree gardens (away from the pool) are some lovely sitting areas with beautiful views. The only sound that you will hear is the sound of waves and crickets. It is a perfect place to have a nap too! Why do we really get to relax at this resort? Because the playgrounds and entertainment for the children are excellent! 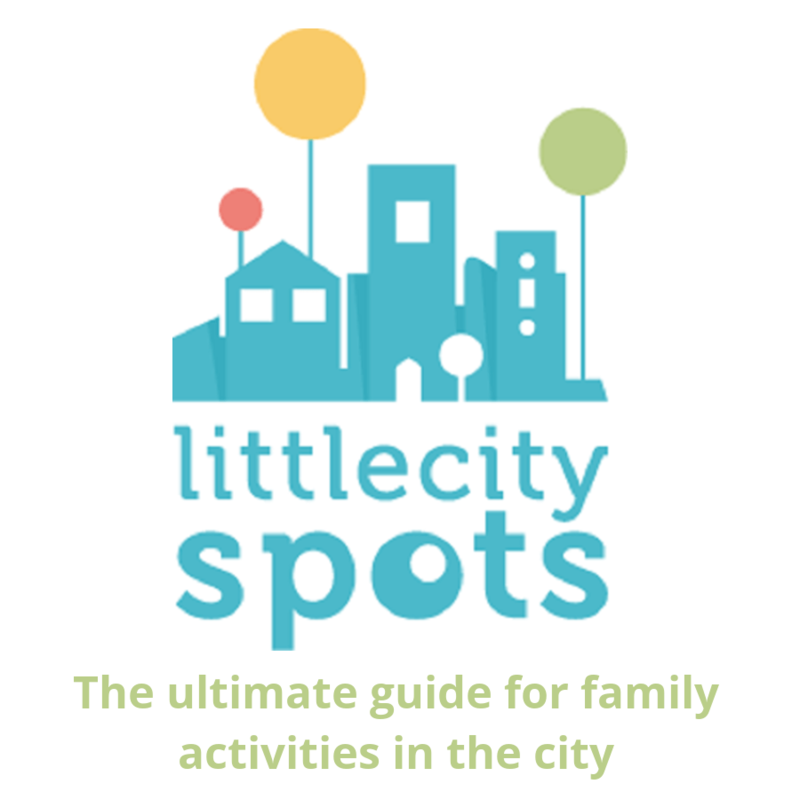 A professional team of educators organizes a programme of kids fun offering all sorts of activities througout the day (with a break from 2pm until 6pm). For babies there is a playroom near the large lobby with soft toys and seats for mom and dad to relax. Next to the poolbar and garden is the inspiring indoor kids-club with board games, puzzles, arts and crafts, movies and toys. During the summer time and on national holidays there are also evening events for the children such as magic shows, theater performances and puppet shows. Over the years I have seen classic puppet shows, funny clows but also interactive experimental theatre for children. The program is never the same and I like that a lot. The educators take the children for a swim in the indoor pool during the day too. They are helped by a professional lifeguard. Whilst I was enjoing the sun, my kids were having indoor pool fun with their friends. For older children there are things to do as well. There are tennis- and basketball courts, table tennis, billiard and mini football. Near the resort is a watersport center for jetskis, waterski etc. There are two outdoor playgrounds at Negroponte Resort Eretria. The first one is a small playground on gras with swings, a slide, a castle and some seesaws. Suitable for kids up to about 5. The second outdoor playground is called Hakuna Matata (‘no worries’). This playground is located in a small 2000m2 area next to the hotel. It is covered by trees and ideal for hot summer days outside. Hakuna Matata has an amazing wooden tree house, an arts and crafts space, a bike route and more for free play. At this place my kids were challenged in team games, had a snack or meal and spent healthy hours in the shade. Me… no worries! Negroponte Resort Eretria offers a la carte dining as well an evening buffet. After a long day in the sun with little kids were are usually hungry and not in the mood to leave our hotel to find a place to eat or choose from a menu. I therefore love the evening buffet dining options at Negroponte Resort Eretria. My kids can see for themselves what they want to eat. The food options in the resort are very good. Local olive oil and fresh (organic) produce from local farmers, many choices in fish, meat and salads and both traditional Greek dishes as well as international food. Nothing too complicated and no haute cuisine. Just quality fresh food. The hotel bakes it’s own bread and makes its own pastry. We have been ordering our daughter’s birhtday cake for yours at the Negroponte chef. Despite her food allergies and the no-egg challenge, the cake was always excellent. Dining in Negroponte with kids is pleasant. It is luxurious and the service is very good. When my children finish their food I let them join the kids club and I can continue my meal and enjoy a glass of wine. I love spending quality time with my family in Negroponte Resort. Everything has been taken care of by the hotel. I like some ”me-time” to relax at the pool or have a swim in the sea by myself whilst my children are happy at the kids club. And at night, we like to have dinner on the veranda overlooking the sea and afterwards we have a cocktail at the pool bar whilst the kids are happily playing in the garden nearby. This hotel is not a hip boutique hotel or a full inclusive bussy resort on a large terian. It is a family hotel that tries to deliver its best on everything they is offered. Negroponte Resort Eretria has been often awarded by Trip advisor for its excellence and I believe that it is well deserved. Negroponte Resort hotel is very suitable for families but they also offer spaces and meeting rooms for business travelers, corporate events, weddings and other functions. I have chosen this place for weekends away with my girlfriends too. Bored to lie around the pool? There is a large gym with a sauna. You can have a massage, play some tennis or rent a bicycles. Around Eretria are plenty of nearby attractions such as the ancient Eretria theatre (2km), wineries, the Monastery of Saint Nikolas (20km), a traditional olive oil factory (12km) and the Archeological Museum of Eretria (2km). The Avantis Estate & Winery (9km) is suitable for childer too. 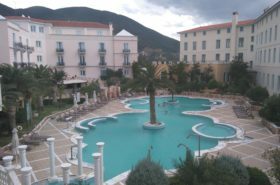 You can easily visit Athens for a day while holiday in this resort. More about things to do in Evia in a next blog post! 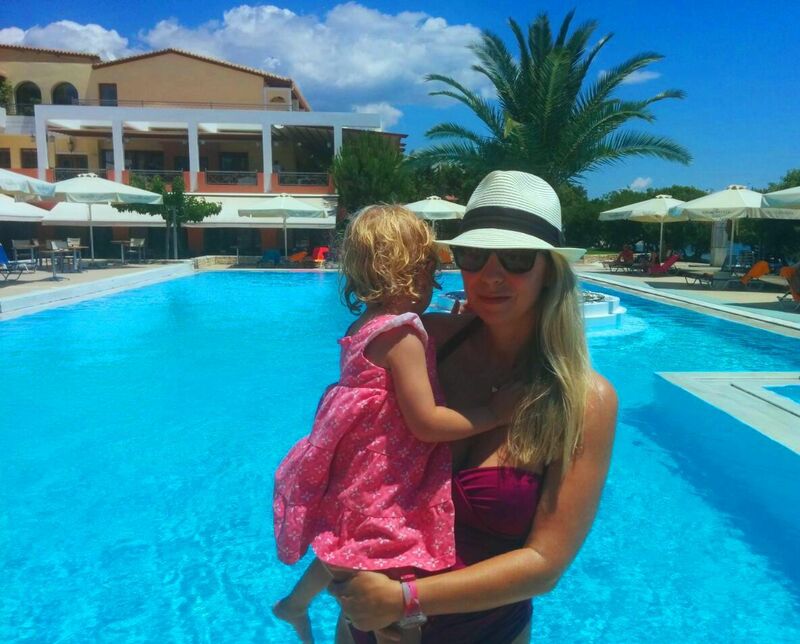 Negroponte Resort Eretria was the ‘birthplace’ of me blogging about family friendly accomodation in Greece. After having spent several ”challenging” holidays with our baby in not-so-baby-friendly- accommodations, I was so happy to finally have found a value for money hotel that got it all right. A place were the whole family can enjoy quality. 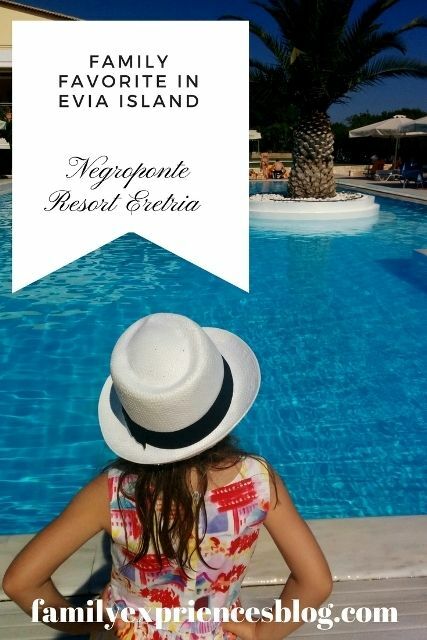 It was here at Negroponte Resort Eretria that I decided to find similar Greek quality holiday destinations and share these with other families. After the holiday to Negroponte Resort, I hooked up with Family Goes Out, were I created my first blog. Negroponte Resort Eretria has set the standard for many holidays to come.